SINGAPORE - Many people struggle to communicate their needs with confidence; think how much time you spend pondering whether an e-mail reads well. 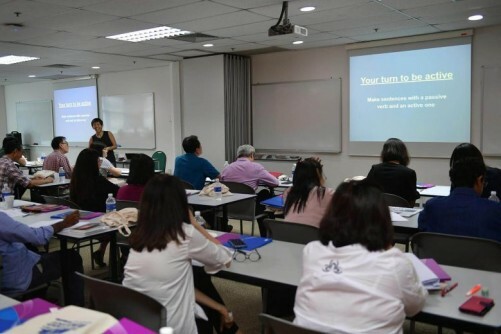 Ms Angelina Choy, a Straits Times senior journalist, sought to change that at an English Skills masterclass for executives on Thursday (Dec 7) that attracted 50 people between ages 20 and 60. The class aimed to help participants write effectively by using simple, clear sentences. Many businesses sent employees to the class, which cost $399, but some individuals also attended on their own accord. "I wish this had been done ages ago," said Mr Pairoj Jirundorn, 57, Asia-Pacific medical director at Vifor Pharma. "English is my second language, so I have sent e-mails sometimes that have caused misunderstandings at work because of this." Changi Airport Group (CAG) sent a group of 13, said Mr Jerome Sng, 27. Mr Sng, who works in emergency airport services at CAG, said: "I signed up because I wanted to find out what my flaws in communication are... I've realised my spelling needs help." He added that his firm plans to send another group of employees to the next class. His colleague, Mr Hariz J., a senior airport emergency services officer, added that "we have a lot of written reports to do, and I find it hard to express my points in them".